Similar to all-encompassing chronicle books on the Kinks (All Day and All of the Night, which I've reviewed previously) and Beatles (The Complete Beatles Chronicle 1962-1970, a book which I've owned for years and intend to review in the future), author Glenn Povey has spent years researching and writing a comprehensive day-by-day diary of Pink Floyd's career. Spanning the births of the band members through the band's official 1965 founding all the way up to 2006 (when it was published), Echoes documents every concert, recording session, single and album release, television, radio, and promotional appearance made by the band over their long and successful career. The book is laid out in similar fashion to the aforementioned Kinks and Beatles books, moving chronologically forward year by year with entries for each appearance by date. Split into distinct eras of Pink Floyd's career, the beginning of each chapter consists of long and detailed write-ups describing the band's activities during that time period, accompanied by numerous photographs or the band and various bits of memorabilia. Following the chapter introductions, the entries themselves contain as much information as Povey was able to uncover in his research, and the amount that is included is rather impressive. Beyond set lists for the concerts, rehearsal times, track lists, and broadcast dates for the TV and radio appearances are included, as well as track and session notes for Pink Floyd's recording sessions. These entries include, when applicable, contemporary reviews from prominent newspapers/magazines/periodicals of the times, shedding an interesting light on how Floyd's music, both on record and in concert, was initially perceived. It can make for some fascinating reading, especially when reviews back then contrast so sharply with retrospective analysis (in particular, I'm recalling the scathing 1975 review for the Wish You Were Here album which was included in the book, especially when it's compared to modern views of the record). Also, it's interesting to see that certain obscure songs were actually played onstage, including some you'd never even consider, such as "Alan's Psychedelic Breakfast" at the tail end of 1970! The book does a good job showing just how relentlessly punishing and grueling Pink Floyd's concert itinerary was up until the end of 1973, as well as how little they actually toured from 1974 onward. The book's timeline ends with the final ever Pink Floyd concert, their 2005 reunion for Live 8, and the death of founding member Syd Barrett in 2006. Short diaries of the solo careers of all five Pink Floyd members follow, and the book concludes with a comprehensive discography. There's not too much more that can be said about a book like Echoes...these type of day-by-day chronicle books can either be done extremely well or they can come off as shoddy, poorly researched jobs. Echoes continues in the tradition of the Kinks and Beatles books mentioned earlier as one of the very best. The amount of research the author put into the book is staggering, especially considering what he was able to dig up for the band's early years when they had a loosely held together, constantly rotating membership and changed their name as frequently as their socks, playing various small student gatherings and underground gigs before solidifying into Pink Floyd in 1965. Echoes is readable from front to back, but it's also quite useful as a reference book; just pick a years or event of interest, flip to that section, and the information is right there at your fingertips. 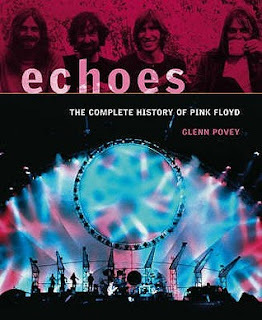 Echoes is a valuable and informative tome that is essential for any Pink Floyd fan, especially its value as a comprehensive reference for collectors of the band's live and promotional work. A few minor typos aside, this book is as good a day-by-day chronicle of Pink Floyd's history as there ever will be and is worthy of being on any Pink Floyd fan's bookshelf. I'd been kicking around the idea for this post for a while, but the recent release of Star Wars Episode VII: The Force Awakens back in December gave me the necessary kick in the arse to sit down and write it now. You see, I've been a huge Star Wars fan for my entire life, or at least as much of my life as I can remember, which goes back to about the age of three. While I'm not one of those fans who dresses in costume, learns to speak the alien languages from the films, or tries to use the Force to move objects around, I have seen the movies an obscene number of times and known way more about the minutiae of the Star Wars universe than I probably need to. It's not the only science fiction franchise I'm a big fan of...I also love Star Trek, for instance, but for different reasons. While Star Trek appeals more to me because of the deeper themes, more complex storylines, and it being a more realistic vision as to what the future may hold, Star Wars is just rollicking good fun. Creator George Lucas has stated numerous times that he was inspired by the Flash Gordon serials he loved to watch a a kid, and the label of swashbuckling space opera that has been levied on Star Wars seems more than appropriate to me. In discussing my love of Star Wars, let me point out that I was born at the beginning of 1980, so even though I was too young to see the original trilogy in the movie theaters, my parents did and I grew up never knowing a world in which they didn't exist. I was three years old in 1983 when Episode VI: Return of the Jedi was released and I had (and still have) a lot of memorabilia from that era. I used to have several of the action figures and playsets, including the Ewok village, but all I can find now in my garage and my parents' basement are a few scattered figures (the Rancor keeper, General Madine, an AT-ST walker) and two books: one a full color picture book of the movie and the other a pop-up book with highlights from the movie's story. My love for all things Star Wars really blossomed in the late 1980s when I saved up enough of my money from Christmas and birthday gifts in order to buy the original trilogy on VHS...in fact, it was a boxed set of all three movies, plus a fourth tape about the behind-the-scenes making of the films called From Star Wars to Jedi. I've still got the tapes somewhere, but from that moment I probably watched the films every few months and learned all I could about the characters, alien races, planets, and backstory of the Star Wars universe. This was aided greatly by some books my mum bought me in the early 1990s: three of them were on the making of the films and included a wealth of information, concept art, and special effects secrets, while the fourth was a Star Wars encyclopedia. I was able to come full circle when the original trilogy was re-released in movie theatres in 1997 to celebrate the 20th anniversary of the the first of the series to be released, Episode IV: A New Hope. While it was a thrill to see all three on the big screen and with surround sound, it was quite jarring to see how George Lucas had modified the films I had memorized by heart over my entire life up that point. While some of the additions weren't too bad (for example, adding more X-Wings in the background during the assault on the Death Star), others were unnecessary (changing the band and music in Jabba's palace), clunky (re-inserting the deleted scene in A New Hope where Han Solo now talks to a CGI Jabba the Hutt, a scene that is actually beneficial in explaining why Jabba is after Han, but which suffers from primitive CGI), to the downright stupid (having Greedo shoot first). I vowed there and then that I would never watch the modified versions of the films again, although this became increasingly difficult to do as Lucas made sure only the special editions were available to buy on DVD and digital download going forward. That being said, I continue to enjoy all of the films and have come to appreciate them more with the passage of time, especially the prequels. (I even don't hate Jar-Jar Binks as much as I used to, even though I could still do with MUCH less of him in Episode I). I also need to mention that Ewan McGregor's portrayal of the younger Obi-Wan Kenobi was tremendous throughout all three prequels and he is firmly cemented as one of the great characters and performances across the entire series. Even the way he appropriated Alex Guinness' mannerisms and accent from Episodes IV-VI in order to make him wholly believable as the younger version was masterful (not to mention he's long been a favorite actor of mine). The original trilogy will always hold the most special place in my heart as those were the original three movies that hooked me and everyone else, and as you can see above they make up three of my top four films in the series. Even though I ranked the new film fifth, I thoroughly enjoyed it and think it is a worthy and perfect continuation of the series, capturing the spirit of fun, adventure, and humor that was at its most effective in the original trilogy and which was slightly lacking in the prequels. (I'm deliberately shying away from saying anything more about the new film in case any of you reading this still haven't see it yet!). Seeing so many of the old characters in the film and falling in love with the new ones was really cool and struck the right balance between nostalgia and something new that was needed to appease the older fans while bringing in the new ones. What's been the best thing for me lately about Star Wars, besides it giving me an excuse to relive my childhood (some would say I still haven't outgrown it) and revel in my geekiness for all things Star Wars-related, has been getting my kids into it. In particular, my second oldest daughter and my son sat and watched all six films in order with me in the weeks leading up to the premiere of the new one. My son has been into Star Wars the past couple of years in terms of toys and costumes (he's been an X-Wing pilot the last two Halloweens), but it's turned into a full-blown obsession akin to how I was at his age. He dressed in his X-Wing pilot costume and my daughter dressed as Princess Leia (complete with the hairstyle, courtesy of my talented wife!) when we went to see The Force Awakens. Although I don't think their goosebumps matched the nostalgic rush of mine when the opening fanfare and story crawl first hit the screen, they were definitely on the edge of their seats with excitement as much as I was. Getting back to my son, he has loads of Star Wars action figures, Legos, cars, etc, and now that he has learned to read he is devouring every book about the films and the Star Wars universe that he can get his hands on. He is even blowing me away with his knowledge of the different creatures, planets, vehicles, characters, etc. He knows which movie certain events happened in and at the age of six and a half, as well as how and why they connect with the other films. Another thing that has struck me is that since he has grown up in a world where the six films have existed, some of his favorite characters and moments actually come from the prequels. Yes, he loves Luke, Leia, Han, Chewbacca, Yoda, and Darth Vader, but he also routinely lists Mace Windu, Anakin, General Greivous, Qui-Gon, Darth Maul, and Count Dooku as some of his favorites. His willing acceptance and enjoyment of the prequels for what they are allowed me to watch them with a less cynical eye and realize that while they are for the most part definitely weaker than the original trilogy, they also suffered from the unrealistic weight of expectations leading up to their release (especially Episode I, which had sixteen years of anticipation and a huge amount of hype leading up to its release that it could never meet or exceed) and they have been overly vilified by fans and critics alike. Sure, they're weren't as good as the originals, but they certainly weren't as bad as the conventional wisdom makes them out to be, either. That's my opinion, at least. With all of this being said, my kids and I are now eagerly counting down to the release of Episodes VIII and IX. While I consider myself fortunate that I've been able to see all of the films on the big screen, I'm also glad that my kids will get a chance to experience the excitement and anticipation of each new film in a new trilogy. Additionally, their experience of seeing the six films in order from I-VI as opposed to how I and others of my generation experienced them (IV-VI, and then I-III) is different enough that I'm glad it gives them their own unique way to experience the wonder and fun of the Star Wars saga. In the end, sharing in all of this fun and sense of wonder in the realms of imagination with my kids is the best part about the entire experience for me. The 2010s are a remarkable decade as every year seems to be a 50th anniversary for something or other that happened in that most epochal of decades (at least in terms of music and cultural change), the 1960s. Since 1965 is often considered the year that pop music truly transitioned to "rock," it only makes sense that there would be a book dedicated to the groundbreaking album released by the biggest band of them all at the tail end of that year. In this new book (with a rather unwieldy title), author John Kruth aims to delve into the Beatles' first masterpiece in terms of both songwriting and production, placing it in the context of its time as well as detailing the aftereffects of its impact to the present day. Upon starting the book and noticing that it was two hundred pages, I was a bit skeptical as to how the author was going to fill it all up talking about a single album and its two associated non-album singles ("Day Tripper" and "We Can Work it Out") that clock in at less than an hour total. The first couple of chapters were of a personal nature, with the author describing his childhood and how he got into the Beatles, as well as what was happening in the 1960s around him. However, it didn't really make a lot of sense as he was describing 1960s America which was across the pond from London where the Beatles were living and working. This US/UK dichotomy ended up being one of the most confusing and frustrating things about the book...the author used both the original UK Parlophone edition of the Beatles albums (which is how the band always intended them) as well as the bastardized Capitol US versions interchangeably. For seasoned Beatles fans such as myself it was an annoyance, but I could see how a more casual fan would be thrown off by this. In fact, this is but one of the many small annoyances I had with this book that made it a frustrating and unsatisfying read overall. The author's writing style was not to my particular liking, coming off a bit too youthful and somewhat clunky. There were some typos and grammatical errors throughout the book, although I'll chalk those up to editors rather than the author himself. The general layout of the book after the personal introduction consisted of a couple of chapters setting up the recording and release of Rubber Soul, followed by chapters dedicated to each song. It got a bit confusing, however, in that the author included the songs from the American version of the album (arguably the only time a Capitol-altered version of a Beatles album didn't ruin it, and according to many fans, actually improved it) as well as the British version. This means that many songs from the UK Help! album are discussed, which in my opinion doesn't really make sense since those songs were written and recorded six or more months before Rubber Soul (with the exception of "Wait," written and initially recorded during the Help! sessions but not finished or released until Rubber Soul). The end of each chapter then includes a short section called "Rubber Covers" detailing notable cover versions of the particular song discussed. Most chapters include some basic session info for each song as well as the inspiration behind each song, although there was nothing new for obsessive Beatles fans and much of the source material and quoted passages were instantly recognizable as being from various books or the Anthology. There were also a lot of factual inaccuracies throughout, although how many were due to the author's ignorance as opposed to his clunky writing style I can't say. One glaring instance is where he mentions how very shortly after John met Yoko in late 1966, they recorded the infamous Two Virgins album and became a couple, leading to John abandoning his wife Cynthia and son Julian, which actually didn't happen until almost two years later. Now, it's very possible that the author is well aware of this (and he should be...it's incredibly well documented) but the way the passage is written makes it seem as though it happened mere weeks after their initial meeting. There are many sections of the book like this which became increasingly frustrating to read. Whether they were because of Kruth's lack of knowledge or his confusing writing style, either reason is unacceptable and, in my opinion, should've been corrected at the editing stage. I had more problems with this book that I'd like to bring up, too. First, the background chapters on the 1960s and Beatles influences ended up feeling more like a general history of the decade (and of Bob Dylan in particular). While I get what the author was trying to do here and readily acknowledge the huge influence Dylan had on the Beatles (and John in particular), it began to distract from the point of the book and dragged on far too long. Second, the "Rubber Covers" sections didn't really add anything interesting to the chapters and in many cases became very repetitive as the same tribute albums and/or artists were mentioned over and over. Third, there seemed to be more of a focus on 1964 and 1966 in many of the chapters than on 1965, the year in which Rubber Soul was actually conceived and created. While I can at least see that the trends and experiences of 1964 factored into the creation of the album, 1966 and beyond had nothing to do with it. While the Beatles certainly built off of the achievement of Rubber Soul as they went into 1966 and beyond, the book didn't really need to expound as much on what they did after as it did, at least in my opinion. Finally, Kruth clearly has a lot of admiration for John Lennon, which shone through loud and clear, but while he also credited Paul McCartney for his talents, there were a lot of subtle and snide swipes at McCartney's personality, shortcomings, and his solo career. It got tiresome reading the same tired tripes about how John was the better of the two (as I've said repeatedly, they were BOTH essential) and really, in a book about an album smack dab in the middle of the Beatles' career, why is Paul's solo career being repeatedly brought up and picked at? 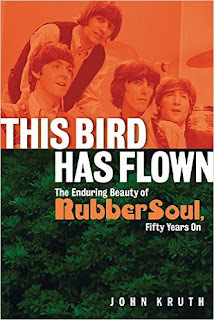 While a scholarly, thoroughly detailed look at Rubber Soul and its place in both the 1960s and 20th century history would be a welcome addition to the Beatles literature, This Bird is Flown isn't that book. To me, it felt exactly like I thought it would when I first started reading it: a short book about a single album that was padded with a lot of blandly-written extraneous material in order to justify its length as a book rather than a pamphlet. I will come right out and flatly say that I didn't enjoy this book and I didn't learn a single new thing from it. Perhaps being as fanatical and knowledgeable about the Beatles and their music as I am is the reason I feel this way, and I'll concede that this point may very well color my opinion. But unless one is a very casual or ignorant (in the literal, not pejorative sense of the word) Beatles fan, this book is far from essential.